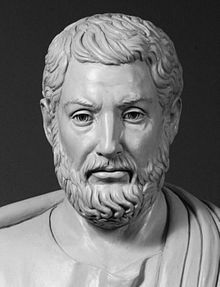 Cleisthenes (/ˈklaɪsθəˌniːz/; Greek: Κλεισθένης, an aa Clisthenes or Kleisthenes) wis a noble Athenian o the Alcmaeonid faimily. He is creditit wi reformin the constitution o auncient Athens an settin it on a democratic fuitin in 508/7 BC. This page wis last eeditit on 28 October 2015, at 01:06.